Previously we reported that the Caddo Parrish Metropolitan Planning Commission (MPC) had declared a war on reading by determining that a Little Free Library set up in the front yard of Ricky and Teresa Edgerton was a commercial venture. The story has gained national attention and caused the Shreveport City Council to step in. This is just the first step in complete legalization of Little Free Libraries, but it allows the Edgertons’ to remove the padlock from their library box and resume sharing their love of reading with their neighbors. Councilman Jeff Everson, who had vowed to address the zoning complaint was instrumental in getting the temporary resolution passed. The Edgertons’ are no longer required to fork over a $500 fine for sharing books with their neighbors and Shreveport is beginning the process to bring their antiquated zoning laws into the 21st century. A planned celebration and grand re-opening of the Edgerton’s Little Free Library is being held on the day of the Krewe of Highland Mardi Gras Parade on Sunday. This all started because of an anonymous complaint from a resident of the city. In a feeble attempt to justify their actions in this matter, Lea Desmarteau, MPC Board chair, stated that their job was to enforce the zoning laws. Hopefully, with the changes being proposed, the MPC will cease and desist penalizing neighbors for being neighborly. 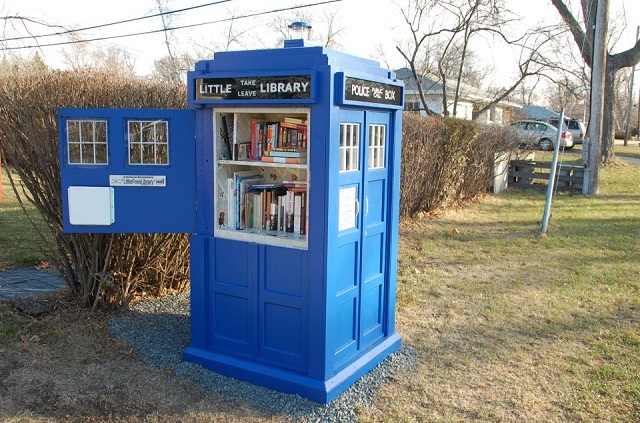 Featured image of the Tardis inspired Little Free Library was found at BookRiot.com, who attributed it to Karen B. Nelson, a lifelong educator.